The South of Scotland Masters tournament was held at Dumfries Squash and Racketball Club on 21/22 November 2015. There were a total of 46 competitors who took part in one Ladies O50s and 7 mens’ events. Unfortunately there were insufficient entries to hold a mens’ O45 event. 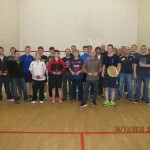 Sue Strachan and the Dumfries Squash Club committee managed a very well organised tournament. They all worked hard to make all competitors welcome and provided an excellent catering service thoughout the tournament. Thanks are also due to SSRL (Lisa McKenna and Ross Cairns) for managing the entry and supporting the Dumfries committee in running the tournament. Mike Halpin and John Crawford supported the committee by providing refereeing services throughout the tournament. At the prize giving Peter O’Hara, on behalf of the competitors thanked Sue and the committee for all their hard work in the organisation and the draws. Alex Sinclair quickly assessed the South of Scotland results and updated the Masters Tournament Points. Alex emailed the updated Points to his Masters’ distribution list of about 350 players who have participated on the Scottish Masters circuit over the previous 10 years’. There were four competitors and the competition was played as a round robin with four matches on Saturday and two matches on Sunday. In the Saturday morning matches Pauline Douglas and Sue Strachan both played well to beat Christine Graham and Norma Gregory 3-0 respectively. In the afternoon Pauline and Sue continued their good form by beating Norma and Christine. In the Sunday matches Christine demonstrated her all round court skills by beating Norma Gregory 3-0. In the last match and effectively the final the gallery were entertained to a competitive match between Sue and Pauline. Sue hit the ball hard and moved Pauline around the court whereas Pauline demonstrated her skills with some excellent lobs and drop shots. Sue deservedly won the match 3-0 but all three games were closely contested. Sue Strachan was therefore the winner and Pauline Douglas was runner up. There were three competitors and the competition was played as a round robin on Sunday. In the first match Peter O’Hara comfortably beat David Morrison 3-0. This set up the potential final between Peter O’Hara and Andrew McBean and the large gallery was entertained with numerous long hard hitting rallies in a very competitive match. Peter O’Hara won 3-0, but all three games were closely contested. In the last match Andrew McBean beat David Morrison 3-0 in an entertaining match. Peter O’Hara was therefore the winner and Andrew McBean was runner up. There were seven competitors and the competition was played as a knock out. A late withdrawal meant there were only two quarter final ties on Saturday morning. In the first tie David Emery played David Lindsay and in the second Roddy Campbell played David Massey. In two competitive matches David Emery and Roddy Campbell both won 3-0 and progressed to the semi finals. In the semi finals Peter O’Hara played Angus Woodward and Roddy Campbell played Douglas Emery. The top seeds Peter and Roddy both played well and won 3-0. On Sunday afternoon Peter again entertained the gallery and comfortably won the final 3-0, with Roddy the runner up. In the final of the plate Angus Woodward beat David Lindsay in the final 3-0. With seven entrants in the Men’s Over 50s competition, a fourth consecutive round robin in the age group in these year’s Masters series was avoided – just. Morning fixtures saw several experienced Masters competitors make their first appearances of the season, including Jimmy Wells, who eased through 3-0 against Tom Smith. Meanwhile Ronnie Carter and Garry McKean were involved in a much closer match, with Garry winning the first two games before Ronnie played his way into form and back into the match, ultimately winning 3-2. Completing the morning matches, Colin McMullen progressed at the expense of Archie McGillivray, with 3-1 the winning margin. Colin’s reward for that win was a semi-final on Saturday afternoon against Brian Robertson, with the other semi a Dumfries head-to-head between Jimmy and Ronnie. The first game of the Colin v Brian match was close, but it was Brian who won through and gained the momentum needed to take control of the second. Despite a valiant effort by Colin in the third, Brian completed the job in 3 games. Garry McKean and Tom Smith played for the right to play Archie McGillivray in the final of the plate competition and it was Garry who prevailed, 3-1. Only the finals remained to be played on Sunday, starting with the plate. Garry maintained the level of consistency he had shown over the weekend, beating Archie 3-1, compensation of sorts for the loss to Ronnie on day 1. Ronnie made the better start in the first game of the final, Brian guilty of over-hitting on what was a warm court. However, Brian struck back in the second, finding his range while at the same time Ronnie’s normally deadly boasts were sitting up due to the court temperature. Having levelled at 1-1, the third and fourth games followed the same pattern as the second, with Brian gaining a level of control for a 3-1 win. There were nine competitors and the competition was played as a knock out. In the only first round tie David McAleese beat Lance Marshall 3-0. The pick of the quarter finals was a very competitive match between Alan Law and Richard Easton. Richard won the first game but Alan fought back with numerous winning reverse angles to take the second and third games and a 2-1 lead. Richard won the fourth game to level the match at 2-2. In an entertaining final game Alan played well and held his nerve to win the match 3-2 and progress to the semi final. In the other three quarter finals Alan Thomson beat Les Wilson, Keith Gristwood beat Rolf Hansen and Chris Holt beat David McAleese – with all the matches being won 3-0. In semi finals Alan Thomson played Keith Gristwood and Chris Holt played Alan Law. The top seeds Alan Thomson and Chris Holt both played well and ran out comfortable winners and progressed to the final. Alan Thomson – despite the need for headache tablets during the knock up – demonstrated the form he displayed in winning the O55 European Masters in Malmo in August. He entertained the gallery with his floating lobs and deceptive soft drops to comfortably beat Chris Holt 3-0 in the final. In the final of the O55s plate Les Wilson beat Lance Marshall 3-0. There were eight competitors in a simple knock-out format. The four quarter finals were all relatively simple 3-0 wins for the four seeded players. In the semi between John Rae and Eric Donohoe, John was much more alert after his shock defeat to Eric, two weeks before in Oban. It was 1-1 all, after two gruelling games and the match probably hinged on the third game which Eric lead 5-0 but which John eventually won after both players squandered four game balls each. John won the fourth game 9-4 to take the match 3-1. The other semi was Jim Dougal v John Charles which Jim won 3-0 albeit all of the games were very competitive. That left another Rae v Dougal final on the Sunday. It was John’s third match of the day (after beating Ian Ross and Dave Sturman in the O65s). John won the first 2 games but only just staggered over the finishing line in the third 10-8 after Jim had failed to convert two game balls. John’s total of seven wins inside 28 hours was a notable effort. In the final of the O60s plate Walter McAllister beat Lance Marshall 3-0. There were five competitors and the competition was played as a round robin with five matches being played on Saturday and five on Sunday. In the early Saturday morning matches John Rae comfortably beat an ‘out of sorts’ Emilio Fazzio 3-0. The other match between Dave Sturman and Ian Ross was a very close contest. Dave started well and won the first game but Ian recovered to win the second and third games to lead 2-1. In the fourth game Dave raced to an 8-1 lead but Ian clawed back to 8-8 but to his credit Dave held on to win 10-8. In the final game Ian took an early lead and won the game 9-1 and the match 3-2. In the remaining games on Saturday John Rae and Ian Ross beat Roy Gordon 3-0 and 3-1 respectively. In the final game Dave Sturman comfortably beat Emilio Fazzio 3-0. In the early Sunday morning matches John Rae played well to beat Dave Sturman 3-0 in a tight match. In the other match Emilio Fazzio beat Roy Gordon 3-1 in an entertaining and competitive match. In the afternoon matches John Rae demonstrated his good form and completed his ‘grand slam’ by easily beating Ian Ross 3-0. Dave Sturman completed his matches by beating Roy Gordon 3-0. In the final match Ian Ross easily won the first two games against Emilio Fazzio. However for the first time over the weekend Emilio demonstrated his potential by winning the last three games and the match 3-2. John Rae was the clear winner but the runner up was less clear as Dave Struman, Ian Ross and Emilio had all won two matches and lost two matches. Dave and Ian lost one of their matches 3-2 and therefore Emilio was eliminated. Although Dave had a better ‘goal difference’ than Ian, Ian was declared the runner up as he had beaten Dave in the ‘head to head’. The Over 70s group included one O75 (Vinnie Taylor) and one O80 (David Rogan) as well as Bernard Starkey, Alfie Thompson and Ken Reid. David showed that he still has the excellent racket skills, which had earned him so many titles in past events, but lacked mobility, due to a leg injury and so, although certainly still very competitive, lost out to all four of the others in the group. Vinnie Taylor had a good 3-0 win over Alfie Thompson, but lost 1-3 to both Bernard Starkey and Ken Reid, despite taking the first game in both these matches. Bernard and Ken both had 3-0 wins against Alfie. Thus, before the last match played in the event, both Bernard and Ken had three wins and 9 group points. In this last match, Bernard went two games up, then Ken pulled back the match to 2-2, and went 6-0 up in the fifth, only for Bernard to complete an even better come-back, and eventually won the match, 10-8 in the fifth game. Thus Bernard is very much the leader in the O70s events this year, now having also recorded overall wins at the Highland Masters and the Tayside and Fife Masters.